Jesus told this story to his disciples: “There was a certain rich man who had a manager handling his affairs. One day a report came that the manager was wasting his employer’s money. 3 “The manager thought to himself, ‘Now what? My boss has fired me. I don’t have the strength to dig ditches, and I’m too proud to beg. 5 “So he invited each person who owed money to his employer to come and discuss the situation. He asked the first one, ‘How much do you owe him?’ 6 The man replied, ‘I owe him 800 gallons of olive oil.’ So the manager told him, ‘Take the bill and quickly change it to 400 gallons. 7 “‘And how much do you owe my employer?’ he asked the next man. ‘I owe him 1,000 bushels of wheat,’ was the reply. ‘Here,’ the manager said, ‘take the bill and change it to 800 bushels. 9 Here’s the lesson: Use your worldly resources to benefit others and make friends. Then, when your earthly possessions are gone, they will welcome you to an eternal home." Extending credit, goods, or rentals, etc. 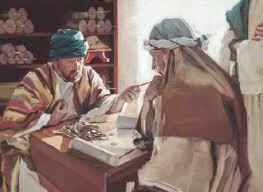 and not getting paid back - the parable indicates that many debtors owed him... why? why did the manager allow the debt to accumulate to the point that the rich man had to ask him for an accounting, or be fired - sounds like it was out of control for awhile, doesn't it? So the manager [the unjust steward] was put on the spot - he was asked for an accounting - a report of what the financial health of the owner was - a charge of mismanagement. The manager obviously was not forcing those who owed debt to the owner - to be held accountable, and pay what they owed - so he, in turn, was held accountable to the owner, for not making the debtors accountable to the manager who was in charge of the rich man's affairs. How did the rich man know that the unjust steward was in fact, unjust? 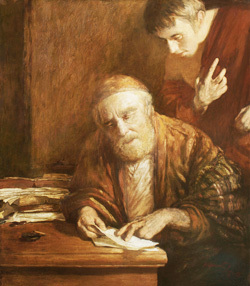 Did the rich man speak to one of those who owed him money for details of the deal he had made with the unjust steward? describe the manager as "shrewd?" The manager [unjust steward] had the unique ability to kill two birds with one stone - in other words - to put the bills and agreements in order, by making the debtors happy to pay a lesser amount. The owner, the rich man was now assured that he would be paid by every debtor - a discounted amount was to be more acceptable than having to chase after late payments, or no payments at all. That each debtor accepted responsibility to pay quickly, and happily! He not only knew the formula to create acceptable deals for all parties...but he was also unafraid to go ahead and make it happen. Remember, GOD works with "imperfect" people - that counts us in, not out! Know the parable "word-picture" and do not get hung up on the confusing interpretations of historical thought or events that have no impact or meaning for our spiritual growth in GOD.